It was a Richmond (Indiana) man, the late Micajah C. Henley, who did much to perfect roller skates from the time he established his roller skate making business here in the early 1880's. 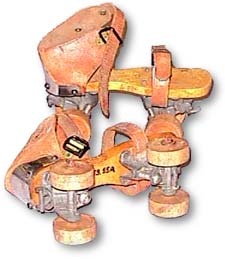 Henley skates became internationally famous and were sold by the millions. Henley patented the roller skate bearing his name in 1884 and he and his son, Harry, produced 15,000 skates a week during the heyday of their business. The skate was known as the "Chicago Skate." The elder Henley started the first roller skate factory in Richmond in 1881 in a barn at the rear of his home, 201 North 14th Street*. The business gradually expanded in various locations until the company finally was installed in a large brick building at North 16th Street and the railroad, which later became the plant of the Indiana Tool Company. The making of roller skates became big business in Richmond in the 1880's. In 1882 the Henley company had a local competitor, the Phillips, Marchant Co. located on North "E" Street between Tenth and Eleventh streets. 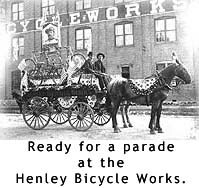 Three other roller skate factories appeared on the scene during that time, but by 1886, the Henley company was the only one listed in the city directory. According to records, the Henley skate factory had no local competition after 1888. In the beginning, Henley began to experiment with lighter wheels for his skates and finally decided upon fiber of Turkish boxwood, which he imported. These wheels proved to be more durable and profitable than earlier ones. After the J.H. Fenton Co., skate manufactures in Chicago, came out with a skate that had a toe clamp and cast-iron bottoms, the Henley company began to modernize it's product. Up to that time, skaters' feet were attached to the wooden bottom Henley skates with straps in front and back. The wooden bottoms were replaced with metal spring-arched footplate and the straps were replaced with clamps fastened with a key. The toe clamp of the Fenton skate, on the other had, had to be fastened with a screwdriver. The next, and most radical improvement to the Henley skate came several years later when ballbearings were substituted for babbitt bearings, something no other maker of skates was doing at the time. 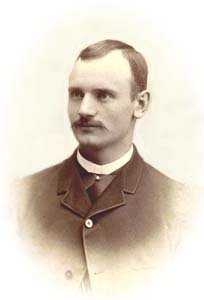 It was Robert Henley, nephew of M. C. Henley, who developed the ballbearing skate. He obtained the idea from the old "safety" bicycles about the time these were rivaling roller skating for mass popularity, in the late 1890's. 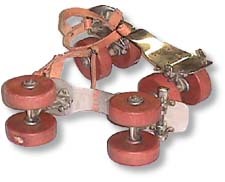 The introduction of ballbearing roller skates was a real "scoop" for the Henley company over its many competitors throughout the country, and the sales of the local skates soared to new records. After Henley retired from active management of the company, it was taken over by his brother-in-law, John Williams. Manufacture of the Henley skate continued until a few years before the outbreak of World War II. No skates were being made in the United States during the war (1941-1945) because they were not listed as essential products. Interest in roller skating still continued in Richmond in the 1940's, however, but not quite as the mania it had been with local residents thought the 1880s and 1890's. Their intense interest had been considerably dimmed with the advent of the bicycle and , later, the automobile. The fact that much local interest still persisted in the 1940s is attested to by the fact that the city's two rinks were well patronized until the Coliseum, in the first block of North Seventh Street, was destroyed by fire January 2, 1944. The second rink, the Rollarena, at 1522 East Main Street, continued operating until December 1948. According to "Roller Skating Through the Years," edited by Morris Traub who operated the Park Circle rink in Brooklyn, N.Y., roller skating had its origin in Holland, the home of ice skating, more than 200 years ago. According to Traub, a Dutchman of the Eighteenth century who was a lover of ice skating decided he wanted to skate in the summertime, too. He nailed some large wooden spools to strips of wood attached to his shoes, and bumped down the pavements and along the roads of Holland. 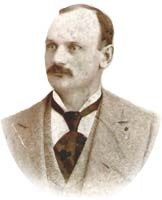 Traub adds that history records Joseph Merlin, a Belgian, as the first maker of roller skates. He reports that Merlin exhibited his invention in London, England, sometime in 1760. It proved to be a disastrous occurrence, however, Traub said. A contemporary account states that because Merlin's "pair of skaites" had not been provided with "the means of retarding his velocity, or commanding its direction, he impelled himself against a mirror of more than 500 pounds value, dashed it to atoms, broke his instrument to pieces and wounded himself most severely." Through the succeeding years there were continuous improvements to roller skates throughout Europe and finally in America. In 1849 roller skating achieved its "greatest dignity," Traub reports, when it invaded grand opera. Meyerbeer had written into the third act of his opera, "The Prophet," an ice skating scene, which had to be presented on roller skates as no one up to that time had invented a successful method of producing synthetic ice. The opera had its premiere performance on April 16, 1849, at the Paris opera house, and it became "the talk of the town." Roller skating had it's introduction in America some time before the outbreak of the Civil War. In 1852 Joseph Gidman "patented a skate," according to "Roller Skating Through the Years," "with coupled wheels in the middle and single wheels at each end." The Woodward skate was brought out in 1859. It's rollers ere made of vulcanized India rubber, "those in the middle being slightly larger than the ones at each end...The rubber wheels were somewhat better than the iron ones previously used because they clung to the wooden boards without any tendency to slip sidewise." Traub estimated that in 1944 there were approximately 40,000 roller skating rinks in the United States. This article reprinted with permission from Norma Carnes Schroeder, former People staff writer at the Palladium-Item. Special thanks to the Wayne County Historical Museum for providing access to the items in the pictures.